RobinLynnBrooks » Powerful Healing Strawberries! Have you noticed how the natural power of healing foods is being heard much more in mainstream discussions today? How about that? Seems many of our ancestors had the right idea all along. Now these “new” discoveries are gaining attention as research studies on the effects of nutrient based science document positive responses at cellular and molecular levels. Today I hope you’ll share with your friends about the organic healthy magic of berry Anthocyanins. Strawberries contain this natural wonder and may just be the perfect treat for your aching back! On a molecular level, berry anthocyanins are shown to turn off those nasty genes involved with inflammation. They are antioxidant flavonoids that protect many body systems and they have some of the strongest physiological effects of any plant compounds. Know anyone with aching joints? The anti-inflammatory properties of strawberry include the ability of phenols in this fruit to lessen activity of the enzyme cyclo-oxygenase, or COX. Non-steriodal anti-inflammatory drugs like aspirin or ibuprofen block pain by blocking this enzyme, whose overactivity has been shown to contribute to unwanted inflammation, such as that which is involved in rheumatoid or osteoarthritis, atherosclerosis, asthma, and cancer. 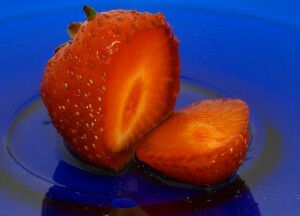 Though unlike some drugs that are COX-inhibitors, strawberries do not cause intestinal bleeding. Anthocyanins in strawberries not only cause the red color, they also have been researched and shown to help protect cells in the body and to prevent oxygen damage in all of the body’s organ systems. The Strawberry’s particular phenol content delivers as an an all in one heart-protective, anti-cancer, and an anti-inflammatory fruit. Now wouldn’t that all make one beautiful side dish or what? Of course you body will thank you. And yum! Special note to anyone who is challenged in finding fresh sources or consuming these types of plants naturally, there are now products available in whole-food supplement form. Simply search the internet or your local health food store. Also, anthocyanins are found in fresh and frozen berries, but not in processed pureed foods so it is best to puree them at home. Great article, cool strawberry pick, excellent reminder to eat the berry! Yes also known for having a desirable oxygen radical absorption capability value for fighting free radicals in the body. Tart cherry concentrates in capsule are a popular pick for joint pain, too. Hey Robin thanks for sharing this – I love strawberries and have rheumatoid arthritis and didn’t even know that they had anti-inflammatory properties – that is great to know! mmmmmmmm….and I LOVE strawberries! Now what about with some ice cream and a little chocolate sauce? Oh, oh..right I lost myself… this is about health! Seriously, I had just read something a short time ago about the healing powers of strawberries… the benefits they and certain other fruits can bring …charged full of antioxidants and other natural agents to help us heal. Thanks for bringing this to our attention, Robin. …and while Rosina is sipping a glass of grape… I’m off to get some french vanilla icecream… and just to keep it healthy , I’ll top it with some shaved dark chocolate! Bon Appetit! Eating strawberries is good, and they are good for you. I knew I liked them for a reason! Great article Robin. I love strawberries too and raise them organically in our home garden. It is great to see other people sharing health information to our starving for knowledge world. Thanks for the informative post. You are welcome. But I want to thank you for sharing your latest post as well. Prescribed poisons are tossed around like crazy. I hope you keep sharing and inspiring the community with healthy knowledge! What a great post. As a chef I already knew some of what you stated in the post but I did learn a few new things about strawberries more specifically. I love it. Thank you for sharing a very informative post that relates to my industry. Have a great day! It is so good to meet you. This is my first time at your site, but i loved the post and liked your site. Wow information is awesome and the site is impressive. Hi Fran, I appreciate that and you do the same I see you are sharing value to online marketers All the best with that!